Lithuania, officially the Republic of Lithuania is a country in Northern Europe, the southernmost of the three Baltic states. Situated along the southeastern shore of the Baltic Sea, it shares borders with Latvia to the north, Belarus to the southeast, Poland, and the Russian exclave of Kaliningrad to the southwest. Lithuania is a member of NATO, the Council of Europe, and the European Union. Lithuania became a full member of the Schengen Agreement on 21 December 2007. Its population is 3.6 million. Its capital and the largest city is Vilnius. In 2009, Vilnius is the European Capital of Culture and Lithuania celebrates the millennium of its name. With the Lublin Union of 1569 Poland and Lithuania formed a new state, the Polish–Lithuanian Commonwealth. The Commonwealth lasted more than two centuries, until neighbouring countries systematically dismantled it from 1772 to 1795, with the Russian Empire annexing most of Lithuania's territory. In the aftermath of World War I, Lithuania's Act of Independence was signed on 16 February 1918, declaring the re-establishment of a sovereign state. Starting in 1940, Lithuania was occupied first by the Soviet Union then Nazi Germany. Prior to the global financial crisis of 2008–2009, post-Soviet Lithuania had one of the fastest growing economies in the European Union. 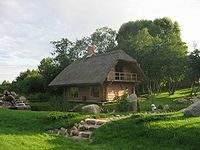 The first people settled in the territory of Lithuania after the last glacial period in the 10th millennium BC. Over a millennium the Proto-Indo-Europeans, who arrived in the 3rd – 2nd millennium BC, mixed with local population and formed various Baltic tribes. The first written mention of Lithuania is found in a medieval German manuscript, the Quedlinburg Chronicle, on 14 February 1009. 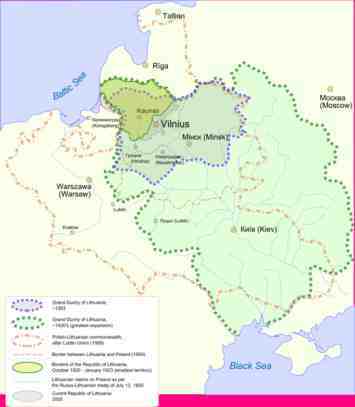 Initially inhabited by fragmented Baltic tribes, in 1230s the Lithuanian lands were united by Mindaugas, who was crowned as King of Lithuania on 6 July 1253. After his assassination in 1263, pagan Lithuania was a target of Christian crusades of the Teutonic Knights and Livonian Order. Despite devastating century-long struggle with the Orders, the Grand Duchy of Lithuania expanded rapidly overtaking former Slavic principalities of Kievan Rus'. Geopolitical situation between the west and the east determined multi-cultural and multi-confessional character the Grand Duchy of Lithuania. 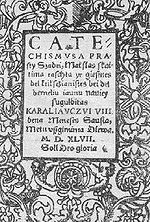 The Lithuanian ruling elite practiced religious tolerance and borrowed Slavic state traditions, such as using Chancery Slavonic language for official documents. In 1385, Grand Duke Jogaila accepted Poland's offer to become its king. 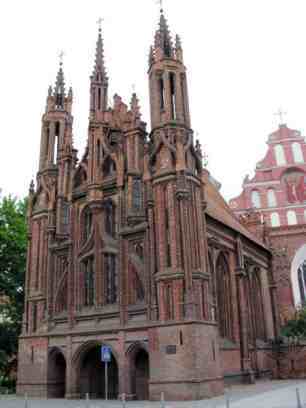 He converted Lithuania into Christianity and established a personal union between Poland and Lithuania. After two civil wars Vytautas the Great became the Grand Duke of Lithuania in 1392. During his reign Lithuania reached peak of its territorial expansion, centralisation of the state was begun, and Lithuanian nobility became increasingly prominent in state politics. Thanks to close cooperation, the armies of Poland and Lithuania achieved a great victory over the Teutonic Knights in 1410 at the Battle of Grunwald, one of the largest battles of medieval Europe. 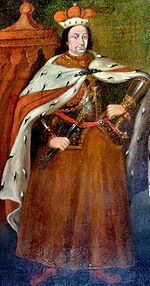 After deaths of Jogaila and Vytautas, Lithuanian nobility attempted to break the union between Poland and Lithuania independently selecting Grand Dukes from the Jagiellon dynasty. However, Lithuania was forced to seek closer alliance with Poland when at the end of the 15th century growing power of the Grand Duchy of Moscow threatened Lithuania's Russian principalities and sparked the Muscovite–Lithuanian Wars and the Livonian War. The Polish–Lithuanian Commonwealth was created in 1569. As a member of the Commonwealth, Lithuania retained its institutions, including a separate army, currency and statutory laws. However, eventually Polonisation affected all aspects of Lithuanian life: politics, language, culture, even national identity. From mid-16th to mid-17th centuries culture, arts, and education flourished, fuelled by Renaissance and Protestant Reformation. From 1573, Kings of Poland and Grand Dukes of Lithuania were elected by the nobility, who were granted ever increasing Golden Liberties. These liberties, especially liberum veto, led to anarchy and eventual dissolution of the state. 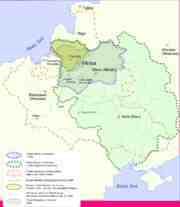 During the Northern Wars (1655–1661), the Lithuanian territory and economy and was devastated by the Swedish army. 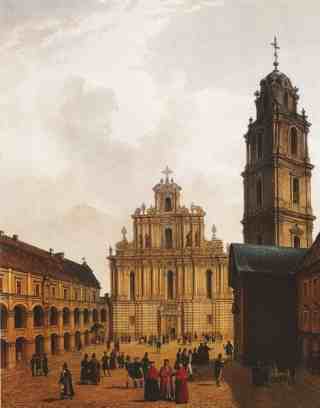 Before it could fully recover, Lithuania was again ravaged during the Great Northern War (1700–1721). The war, plague, and famine resulted in loss of approximately 40% of the country's inhabitants. Foreign powers, especially Russia, became dominant players in domestic politics of the Commonwealth. Numerous nobility fraction used the Golden Liberties to prevent any reforms. Eventually, the Commonwealth was partitioned in 1772, 1792 and 1795 by the Russian Empire, Prussia, and Habsburg Austria. Majority of the Lithuanian territory became part of Russia. After unsuccessful uprisings in 1831 and 1863, the Tsarist authorities implemented a number of Russification policies, including the ban on Lithuanian press and close-down of cultural or educational institutions. Between 1868 and 1914, approximately 635,000 people, almost 20% of the population, left Lithuania. Large numbers of Lithuanians first came to the United States in 1867-1868 after a famine in Lithuania. Nevertheless, the Lithuanian National Revival laid the foundations of the modern Lithuanian nation and independent Lithuania. During World War I, the Council of Lithuania declared independence of Lithuania on 16 February 1918. Lithuania's foreign policy was dominated by territorial disputes with Poland and Germany. Vilnius Region, including Vilnius, the designated capital in the Constitution of Lithuania, was taken over by Polish forces during the Żeligowski's Mutiny in October 1920 and remained under Polish control until the outbreak of World War II. Acquired during the Klaipėda Revolt of 1923, the Klaipėda Region was ceded back to Germany after a German ultimatum in March 1939. 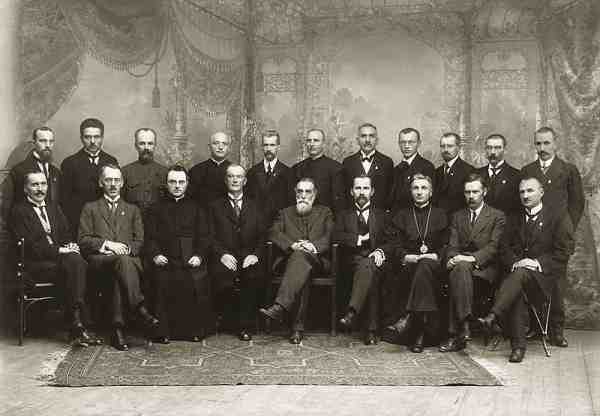 The domestic affairs were controlled by authoritarian Antanas Smetona and his Lithuanian National Union, who came to power after the coup d'état of 1926. A year later Russia was attacked by Nazi Germany leading to Nazi occupation of Lithuania. After the retreat of the German armed forces, the Soviets re-established the Lithuanian Soviet Socialist Republic in 1944. From 1944 to 1952 approximately 100,000 Lithuanian partisans fought a guerrilla war against the Soviet system. An estimated 30,000 partisans and their supporters were killed and many more were arrested and deported to Siberian GULAGs. Population losses of Lithuania during World War II are estimated at 780,000. The advent of perestroika and glasnost in the late 1980s allowed establishment of Sąjūdis, an anti-communist independence movement. After a landslide victory in elections to the Supreme Soviet, members of Sąjūdis proclaimed Lithuania's renewed independence on 11 March 1990 becoming the first Soviet republic to do so. The Soviet Union imposed economic blockade attempting to suppress this secession. The Soviet troops attacked the Vilnius TV Tower and killed 13 Lithuanian civilians on the night of 13 January 1991. On 4 February 1991, Iceland became the first country to recognise Lithuanian independence. After the Soviet August Coup, independent Lithuania received wide recognition and joined the United Nations on 17 September 1991. The last Soviet troops left Lithuania on 31 August 1993 – even earlier than they departed from East Germany. Lithuania, seeking closer ties with the West, applied for NATO membership in 1994. After a difficult transition from planned economy to the free market, Lithuania became a full member of NATO and the European Union in spring 2004. Lithuania since 12 July, 2009. Since Lithuania declared independence on 11 March 1990, it has maintained strong democratic traditions. In the first general elections after the independence on 25 October 1992, 56.75% of the total number of voters supported the new constitution. There were intense debates concerning the constitution, especially the role of the president. A separate referendum was held on 23 May 1992 to gauge public opinion on the matter and 41% of all the eligible voters supported the restoration of the President of Lithuania. Eventually a semi-presidential system was agreed upon. The current administrative division was established in 1994 and modified in 2000 to meet the requirements of the European Union. Lithuania is situated in Northern Europe. It has around 99 kilometres (61.5 mi) of sandy coastline, of which only about 38 kilometres (24 mi) face the open Baltic Sea and which is the shortest among the Baltic Sea countries; the rest of the coast is sheltered by the Curonian sand peninsula. Lithuania's major warm-water port, Klaipėda, lies at the narrow mouth of the Curonian Lagoon, a shallow lagoon extending south to Kaliningrad. The main river, the Neman River, and some of its tributaries carry international shipping vessels. 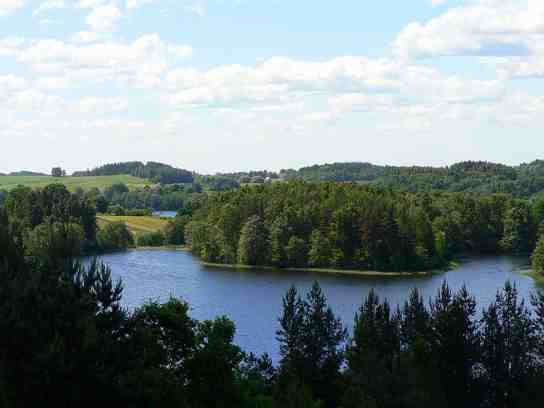 The Lithuanian landscape has been smoothed by glaciers. The highest areas are the moraines in the western uplands and eastern highlands, with the maximum elevation being Aukštojas Hill at 294 metres (965 ft). The terrain features numerous lakes, Lake Vištytis for example, and wetlands; a mixed forest zone covers nearly 33% of the country. According to one geographical computation method, Lithuania's capital, Vilnius, lies only a few kilometres south of the geographical centre of Europe. Lithuania's climate, which ranges between maritime and continental, is relatively mild. Average temperatures on the coast are -2.5 °C in January and 16 °C in July. In Vilnius the average temperatures are -6 °C in January and 16 °C in July. Simply speaking, 20 °C is frequent on summer days and 14 °C at night although temperatures can reach 30 or 35 °C. Some winters can be very cold. -20 °C occurs almost every winter. Winter extremes are -34 °C in coastal areas and -43 °C in the east of Lithuania. The average annual precipitation is 800 millimetres on the coast, 900 mm in the Samogitia highlands and 600 millimetres in the eastern part of the country. Snow occurs every year, it can snow from October to April. In some years sleet can fall in September or May. The growing season lasts 202 days in the western part of the country and 169 days in the eastern part. Severe storms are rare in the eastern part of Lithuania but common in the coastal areas. The longest measured temperature records from the Baltic area cover about 250 years. The data show that there were warm periods during the latter half of the 18th century, and that the 19th century was a relatively cool period. An early 20th century warming culminated in the 1930s, followed by a smaller cooling that lasted until the 1960s. A warming trend has persisted since then. Lithuania experienced a drought in 2002, causing forest and peat bog fires. The country suffered along with the rest of Northwestern Europe during a heat wave in the summer of 2006. In 2003, before joining the European Union, Lithuania had the highest economic growth rate amongst all candidate and member countries, reaching 8.8% in the third quarter. In 2004 – 7.4%; 2005 – 7.8%; 2006 – 7.8%; 2007 – 8.9%, 2008 Q1 — 7.0% growth in GDP reflects the impressive economic development. Most of the trade Lithuania conducts is within the European Union. By UN classification, Lithuania is a country with high average income. The country boasts a well developed modern infrastructure of railways, airports and four-lane highways. As of October 2008, the unemployment rate is 4.7%. According to officially published figures, EU membership fuelled a booming economy, increased outsourcing into the country, and boosted the tourism sector. The litas, the national currency, has been pegged to the euro since 2 February 2002 at the rate of EUR 1.00 = LTL 3.4528, and Lithuania is expecting to switch to the euro on 1 January 2013. There is gradual but consistent shift towards a knowledge-based economy with special emphasis on biotechnology (industrial and diagnostic) – major biotechnology producers in the Baltic countries are concentrated in Lithuania – as well as laser equipment. Also mechatronics and information technology (IT) are seen as prospective knowledge-based economy directions in Lithuania. Lithuania has a flat tax rate rather than a progressive scheme. Lithuanian income levels are lower than in the older EU Member States. According to Eurostat data, Lithuanian PPS GDP per capita stood at 61 per cent of the EU average in 2008. Lower wages have been a factor that in 2004 fuelled emigration to wealthier EU countries, something that has been made legally possible as a result of accession to the European Union. In 2006, personal income tax was reduced to 27% and a reduction to 24% was made in October 2007. Income tax reduction and 19.1% annual wage growth is starting to make an impact with some emigrants gradually beginning to come back. The latest official data show emigration in early 2006 to be 30% lower than the previous year, with 3,483 people leaving in four months. Vilnius University is one of the oldest universities in Northern Europe and the largest university in Lithuania. Kaunas University of Technology is the largest technical university in the Baltic States and the second largest university in Lithuania. Other universities include Kaunas University of Medicine, Lithuanian Academy of Music and Theatre, Vilnius Pedagogical University, Vytautas Magnus University, Mykolas Romeris University, Lithuanian Academy of Physical Education, Vilnius Gediminas Technical University, The General Jonas Zemaitis Military Academy of Lithuania, Klaipeda University, Lithuanian Veterinary Academy, Lithuanian University of Agroculture, Siauliai University and Vilnius Academy of Arts. * Klaipėda port is the only port in Lithuania. * Vilnius International Airport is the largest airport. It served 2 million passengers in 2008. * Ignalina Nuclear Power Plant is a Soviet-era nuclear station. o Unit #1 was closed in December 2004, as a condition of Lithuania's entry into the European Union; the plant is similar to the Chernobyl Nuclear Power Plant in its lack of a robust containment structure. The remaining unit, as of 2006, supplied about 70% of Lithuania's electrical demand. o Unit #2 is tentatively scheduled for closure in 2009. Proposals have been made to construct another nuclear power plant in Lithuania. According to the study carried out by Speedtest.net, Lithuania has the fastest internet upload speed in the world and is fourth by download speed. 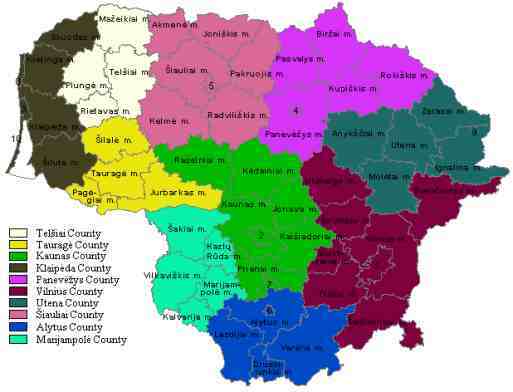 The population of Lithuania stands at 3.3662 million, 84.6% of whom are ethnic Lithuanians who speak Lithuanian which is the official language of the country. Several sizable minorities exist, such as Poles (6.3%), Russians (5.1%), and Belarusians (1.1%). As of 2007 Lithuanian life expectancy at birth was 65 years for males and 77 for females – the largest gender difference and the lowest male life expectancy in the European Union. As of 2008 The infant mortality rate was 5.9 per 1,000 births. The annual population growth rate increased by 0.3% in 2007. Less than 2% of the population live beneath the poverty line, and the adult literacy rate is 99.6%. At 38.6 people per 100,000, Lithuania has seen a dramatic rise in suicides in recent years, and now records the highest suicide rate in the world. Lithuania also has the highest homicide rate in the EU. 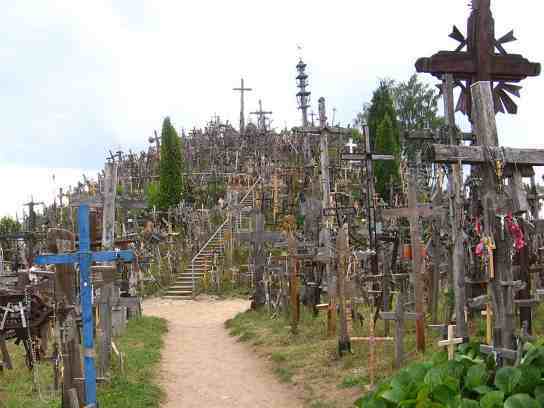 Hill of Crosses. 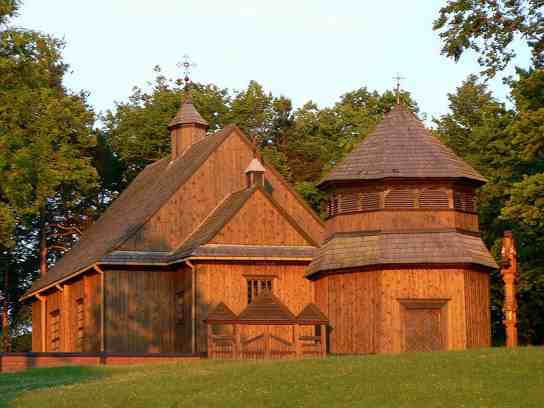 Wooden church in Palūšė. This page was retrieved and condensed from (http://en.wikipedia.org/wiki/Lithuania) November 2009.